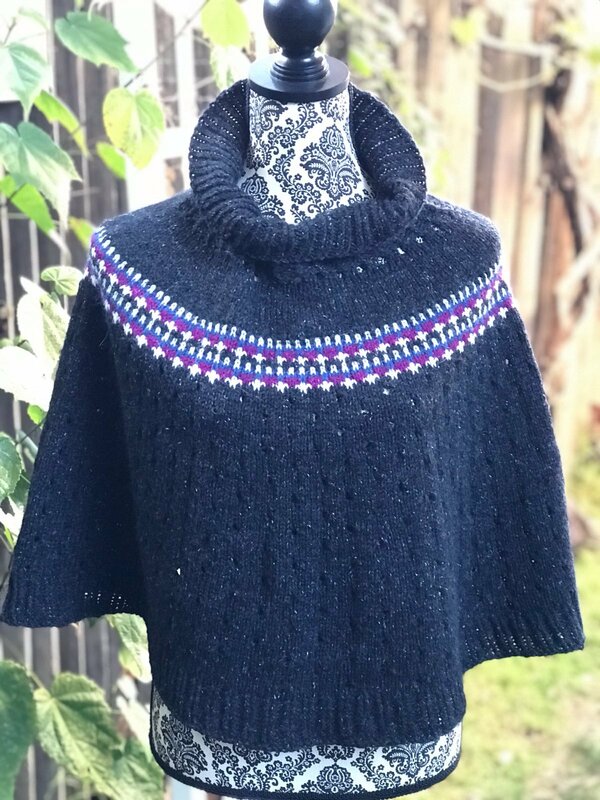 Indigo Frost is a great capelet/poncho worked seamlessly from the top down, with a loose turtle neck and an easy 4 Color-Slip-Stitch pattern band on the yoke. Eyelets on the body, the cute, deep 2x1 ribbings for the neck and the bottom edge, and its shorter length make this capelet a modern take on a classic transitional fashion piece. US 6 (4 mm) 24” (60 cm) and 32” (80 cm) circular needle for ribbings and neck. US 7 (4.5 mm) 24” (60 cm) and 32” (80 cm) circular needle for body. 18 sts x 25 rows = 4 x 4 in (10 x 10 cm) in Stockinette stitch on larger needle. Requirements: Featured Yarn: Hikoo by Skacel Kenzie (160 yards / 50 grams) 6 or 7 skeins of main color needed, 45 yards each of 3 contrast colors Needles US 6 (4 mm) 24? (60 cm) and 32? (80 cm) circular needle for ribbings and neck. US 7 (4.5 mm) 24? (60 cm) and 32? (80 cm) circular needle for body. Gauge 18 sts x 25 rows = 4 x 4 in (10 x 10 cm) in Stockinette stitch on larger needle. The $25 KAL fee is for those that purchase the yarn from GPY. If you choose to bring your own yarn, the price for the KAL participation is $100. SKILL LEVEL: Advanced Beginner Must know how to knit in the round.